The ABC, CBS and NBC evening newscasts on Friday all devoted full stories to the fall in the stock market, touted as “the worst two-day point drop for the Dow in five years,” but barely had time for a sentence about the 3.4 percent second quarter jump in the GDP, the biggest in over a year. In fact, neither ABC nor NBC cited the specific 3.4 percent rise in the Gross Domestic Product, the measure which the AP on Friday described as the “best barometer of the country's economic fitness.” Not one of the three evening newscasts mentioned how the Dow is still well above the 13,000 level it broke through in April and none noted fresh good news on inflation. The Dow fell 208.10, or 1.54 percent, to 13,265.47, with nearly 140 points of that loss coming in the final half-hour of trading. For the week, the index fell more than 585 points, or 4.23 percent. The week's point decline was the worst in five years, while the percentage decline was the largest since late March 2003. The economy popped out of its rut this spring and grew at the strongest pace in more than a year, giving President Bush something to crow about. An inflation gauge closely watched by the Federal Reserve showed "core" prices -- excluding food and energy -- rose at a rate of just 1.4 percent in the second quarter. That was down sharply from a 2.4 percent pace in the first quarter and was the smallest increase in four years. CHARLES GIBSON: Well, it's been a rough week on Wall Street. The Dow closed down 208 points today. For the week, it dropped 586. That's the worst week for the Dow in five years. Even positive news on economic growth wasn't enough to keep investors from selling. Among other things, they had to contend with a battered housing market. 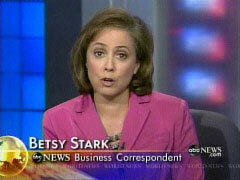 And ABC's Betsy Stark is here. And, Betsy, the housing slump seems to be taking its toll. BETSY STARK: It sure is, Charlie. In fact, buried inside that positive report on Gross Domestic Product today was more evidence of what economists now describe as an outright recession in the housing sector. Just a couple of years ago, housing was a major engine of growth for the U.S. economy. Now, it's a major drag. Americans spent their dollars very cautiously last quarter, spooked by the slump in the housing market. IVY ZELMAN, Housing analyst: When the housing market hits the skids, everybody's feeling pretty concerned and house broke. And they stop spending or they slow down spending. STARK: You don't need to tell Marsha Elliot the spigot's been turned off. MARSHA ELLIOTT, Terrestris Development: The slowdown has been dramatic nationwide, as well as here in the Midwest. And we're all feeling it. STARK: Last year, at this time, this Chicago homebuilder had around 35 homes under construction. This year? Only eight. ELLIOTT: When I'm not building, that means the excavator is not working. The surveyor is not working. The engineer is not working. And that's at the very beginning. STARK: Businesses that depend on homebuilding, from kitchen and bath retailers to furniture and carpet makers, are also getting squeezed. The International Council of Shopping Centers says the worst retail sales in four years can be summed up in one word: housing. ZELMAN: Anything that touches housing to Wal-Mart sales are being negatively impacted. And I think that it's spread. The ripple effect is huge. STARK: At Marvin Windows, one of the largest makers of windows and doors in the country, orders are certainly down. DAN MARVIN, Marvin Windows: The concerns right now is how long the slump in the market is going to last. STARK: Housing-related job cuts have tripled this year to more than 37,000, led by layoffs in construction and mortgage lending. And the consensus is the fallout is going to get worse before it gets better. THOMAS LAWLER, Housing economist: It will probably take another year and a half or two years to work its way through. STARK: That would mean no turnaround in the housing market until close to the end of the decade. And if that's right, it increases the odds of a downturn in the overall economy since housing now accounts for roughly one in ten American jobs, about 15 million American jobs. 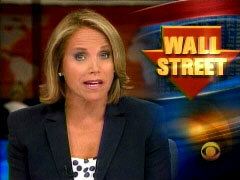 KATIE COURIC: Meanwhile, Wall Street investors may be seeing stars after the beating they took this week. The Dow had another big loss today, more than 200 points. For the week, the Dow gave up nearly 600 points -- or about four and a quarter percent -- its worst week in five years. Here's Kelly Wallace. GEORGE W. BUSH: It's an economy that is large and flexible and resilient. 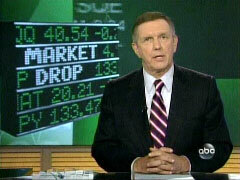 WALLACE: -and still, stocks tumbled. Despite the Wall Street roller coaster, investors like Mary Ellen Scott are not concerned. MARY ELLEN SCOTT, Investor: Well, I've been in it long enough to see it go up and go down and come back, so that's what I'm thinking it's going to do. WALLACE: History is on her side. From 1985 to 2006, the Dow grew an average of 8.6 percent per year. If you invested $1,000 back then, you'd have over $15,000 today. Are the phones ringing off the hook? ALYCE ZOLLMAN, Charles Schwab: Surprisingly, no. WALLACE: Alyce Zollman, a Charles Schwab financial consultant, says she tells her clients to think long-term, and not to panic by short-term swings like we saw this week. ZOLLMAN: But ultimately, I think the most important point is to understand that investing is a lot like the weather. We can't predict the weather. We can't control the weather. The only thing that we can do is prepare for it. And investing's really no different. WALLACE: After a turbulent week, the market can now catch its breath for a few days. The next big economic report, which could determine whether Wall Street continues its wild ride, is the unemployment rate, and, Katie, that comes out next Friday. BRIAN WILLIAMS: Now we move to Wall Street and a dramatic end to a brutal week for the markets: The worst two-day point drop for the Dow in five years. The sellers came out in force. The last half hour of trading today the Dow finished down another 208 points. You combine that with yesterday's 300-plus point drop, that put the loss over 500. We're joined tonight from CNBC by Erin Burnett. Erin, a lot of dire predictions today, downward spirals, corrections, bad hedge funds out there. What's doing this? ERIN BURNETT: Yes, I mean, it has been an amazing week, Brian. You said it, the worst we have seen in five years for the broader markets here in the U.S. and you say, why so much pain so suddenly? Alright, Brian, I broke it down. Three reasons: One, home prices, they are falling more than expected, and two, easy credit. It's simply gone. Loans are harder to come by for everyone. Third, energy prices. You talk a lot about those there, they are up and tonight oil prices closed a penny shy of a record. It is a perfect storm for stocks. But Brian, the truth is it's never quite that simple. There is good news out there and today we found out the U.S. economy is growing a lot more quickly than people expected, despite all of those head winds. I spent all day talking to money managers, the vast majority still firmly believe while the market will be very volatile in the short-term, we could have many more days like this though, they do believe we could end the year higher. So, we'll be talking a lot more about this story. WILLIAMS: Everybody gets to take a breath over the weekend. We'll check back in on this on Monday as you will. Erin, thanks a lot for that.